These low carb egg noodles have the texture of homemade egg noodles. Although they aren’t gluten free they have 0 carbs for a generous serving. They are easy to make with just three ingredients! Use them any way you’d use regular pasta; in soups, casseroles, and with any low carb pasta sauce. They are especially good with the easy Alfredo Sauce recipe right here on Lowcarb-ology. Easy low carb egg noodles have 0 carbs. They're done in under 10 minutes and ready for you to use in recipes like chicken noodles soup right away. Add the cream cheese, eggs, and gluten to the jar of a blender. Pour our on a silicone mat that's placed on top of a heavy baking pan. Smooth out into a rectangle, keeping the batter very thin. Bake at 325F for 5 minutes, or until set. DON'T over-bake! Remove from oven and let set for a couple of minutes before cutting and using as desired. These are best if they are gently simmered in a sauce or broth for a few minutes. 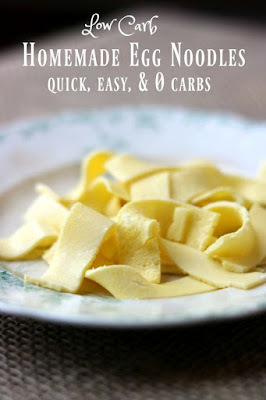 0 Response to "LOW CARB EGG NOODLES: HOW TO MAKE LOW CARB PASTA"